More Than We Imagined is the final report of a year-long project called Ear to the Ground, co-directed by Steve Williams and NTanya Lee. 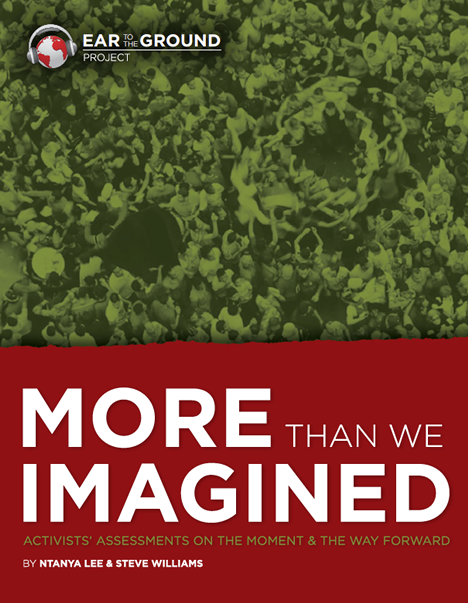 Over nine months, more than 150 social justice organizers in 30 communities across the country were asked to reflect on the nature of this moment of history, their assessment of social justice forces, and what ‘the movement’ should do to respond to the unique challenges and opportunities of this period. Once you have read the report, we would love your feedback on it! Please fill out the feedback form here.